RF Safe preparing you for the zombie cell phone apocalypse of the 20th Century. 20 years of research lead to the making of the BEST RF Protection on the market. Are you RF Safe? As a mother I always want to know everything that could be harmful to my child and how to protect my child. Every other day you hear about another harmful thing in the environment, and only when the headline is good enough do you decide to read it. As humans we naturally think that something is going to kill us anyway. Which is true but what do you want effecting your children’s development?Now it’s a scary thought that a cell phone could be hazardous to children. That your little unborn baby trusting in you for proper development, could be being exposed to harmful, and possibly deadly cell phone radiation. Now I know it sounds crazy that the billion dollar wireless industry has hidden such important information about your phone being harmful. Well unfortunately it’s not, and to top it off it’s been right under our noses all along. SAR Testing is a Joke! All cell phone providers have to list the SAR (Specific Absorption Rate) levels for that device using that companies towers. The FCC (Federal Communications Commission) is in charge of testing, and the setting of safe SAR levels. This test just so happens to be done on a simulation of a 200 pound 6ft man, held at a specific distance that makes that phone safe to use (distance specified in owner’s manual). Doesn’t seem equivalent to my very own head let alone a 5 year old head. Some phone companies have gone as far as saying use with accessory to prevent exceeding legal limits. Not that they seem to specify what kind of accessory to use and how to use it effectively. 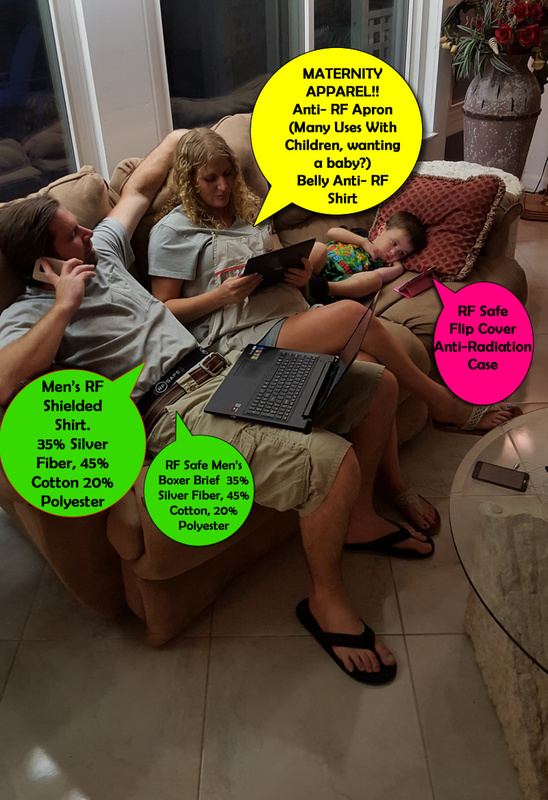 RF Safe has made it a 20 year project to get the most update and accurate information on RF radiation and how it affects your family. In the picture above you see a couple different pieces to an overall system of radiation safety apparel. In the photo above we have Dad sporting some RF Safe Men’s Boxer Briefs this provides 360 degree protection to male reproductive parts. It has been said that cell phone radiation can lead to infertility or birth defects. Dad is also rockin’ the RF Safe Men’s T Shirt, providing protection to vital organs in the torso area. This dad is keeping his future babies safe from birth defects with the RF Safe Men’s Boxer’s and making sure he is around for his kids by protecting vital organs with the RF Safe Men’s T-Shirt. Next is this beautiful pregnant mom, she is shielding baby with double protection, better to be extra safe than sorry. Mom’s seen here wearing a RF Safe Maternity Belly Shirt and RF Safe Maternity Apron. Even though it is not necessary to use both, it does provide extra protection for mama and baby. By adding the extra layer of shielding you’re that much further from radiation, and with the RF Safe Maternity Belly Shirt you have 360 Degree protection. The RF Safe Maternity Apron should be called the universal RF apron, because this apron can be used on children for shielding while using tablets and phones. It can also be used by virtually anyone who is looking for RF protection. On to the first born, he is demonstrating that you can use our RF Safe case as a stand to watch movies or videos at a safe distance. By keeping a distance from the phone the radiation has dropped off to virtually nothing, so his body is not absorbing excessive RF radiation. Children are the future and within them lies our grandchildren future. We need to start protecting them it’s our job. These products are just part of a system of radiation safety products and practices, the more you invest into your safety the safer you are. In return that will make our children safe, preventing wireless technology from taking us out. There are numerous studies out there linking cell phone radiation, to certain effects in adults and children. Some of these health effects are ADHD, Autism, Brain Tumors, Cancer, the list truly goes on. Whether it’s you, your child, or a neighbors its worth sharing the information it could change the way the world is spiraling out of control. It could get us out of the health crisis were in linked to cell phones and microwave radiation. Next article Motorcycle Crash: Safety Gear Destroyed - RF Safe Case Left Phone Unscathed! Previous article Why Would Ants Keep Safe Circular Distance From iPhone? Yet You Don't?